In SQL Backup Master v4.5, we added support for the rapidly growing number of storage services and devices that offer Amazon S3 protocol compatibility. A good example of such a service is Wasabi, a secure cloud storage provider that bills itself as being “simple, affordable, and fast”. You can learn more about their commitment to S3 protocol compatibility here. 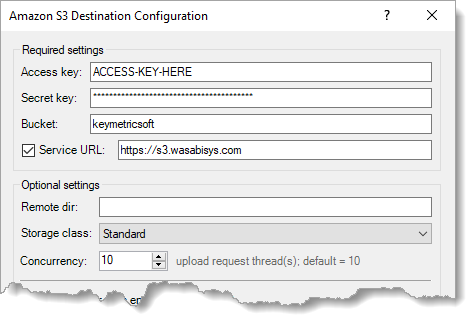 Configuring SQL Backup Master to use Wasabi (rather than Amazon S3) is extremely simple. Just configure the Amazon S3 backup destination to override the Service URL, as shown in the screenshot below. It’s important to note that some S3-compatible storage services (including Wasabi) will not support every Amazon S3 feature. For example, Wasabi does not (at the time of this writing) support bucket-level transfer acceleration or the GovCloud regional endpoint – and will silently ignore any attempts to use such features. For this reason, we recommend that you always make sure you review any S3-compatible storage provider’s compatibility statements prior to using them. Still, Wasabi worked very well in our SQL Backup Master compatibility tests – and there are many other examples of Amazon S3 compatible services and hardware devices (including QNAP QTS) available.